Hi girls, how are you today? 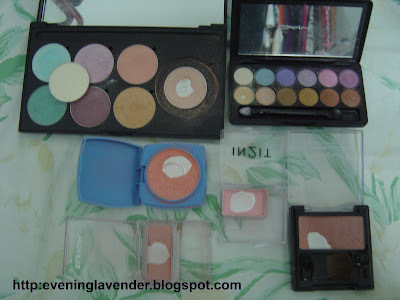 Today I would like to show you my products that actually hit the pan! I am so proud of myself because I actually used the product until they are almost finishing. My Elianto eye shadow that I use as highlighter and my MAC pallet (see the small dent on the lighter shade). 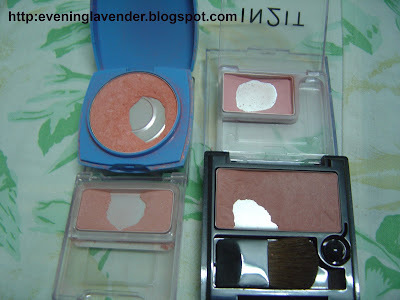 My blushers - Lancome (beige abricot 2), In 2 It (07 desire), Silky Girl (02 Dune Rose) and Revlon (04 softspoken pink)....but I still have 4 new blushers that I have not opened yet. My Lancome lipstick (juicy rouge in 334) that cannot be turned anymore..unless I use my lip brush to get the product. I am very happy everytime I can see the pan of my blusher, eye shadow etc. This is because I know that I am not wasting my money. Do you have the same feeling too? Would you mind showing me what are your "hit pan" products? Pls share..
Hi, thanks so much for visiting and commenting on my site. Yes, I know the feeling of satisfaction when you know you've put a product to good use. I don't have many, myself, lol! Congratulations! oh my... to be honest I have just one product that I ever hit the pan with T_T - it's my very old L'Oreal Trio palette. It's so good, that I am still scrubbing the rest of the product out. i so so love my makeup babies! I know its not that much but I see to it that the pan would be really empty, no product wasted! btw, you're posts are not showing up in my dashboard, eeekk.. blogger, blogger..
Awww it feels so good to hit pan! I should blog about it, too! Hi Pauline, nope, I don't have any that hit the pan yet :) And you look gorgeous after the Lancome makeover! Yay for finishing things ^_^ I just finished my mascara yesterday, I'm barely halfway through my Project 10 Pan though. yes, would love to know abt your 10 pan project! do share..
wow, i never finished any eye shadow product before. Yes you should blog abt your "hit the pan" products too. would like to see yours! I am not sure abt the MAC palette but it says "made in Canada" and it has a bar code. I bought it from a friend who is working in the airport - duty free section. opps... I dont see any hit the pan as I not often using them. but I see skin care product does. Hmm it could be one of the LE things they do for Duty Free. Out of interest, what are the shade names? Yes agree that its easier to finish skincare product that color products. I guess u seldom use them. I don't see any colors mentioned behind the palette. 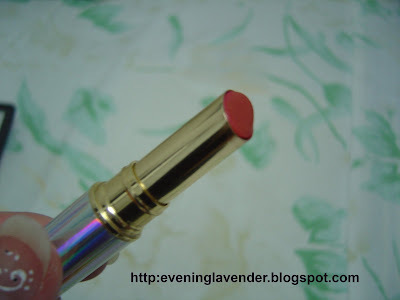 maybe u are right, it may be a dupe!Anyway, I love the colors and its fine texture. The color is very easy to apply too!